With My Needle: Hannah, Rachel, and John--quite a trio! Hannah, Rachel, and John--quite a trio! On Friday I was thrilled to pick up Hannah Lancaster (Porcupine Collection) from my framer. It took longer than normal to get the frame because the molding was back ordered. It was certainly worth the wait. I love the results! In fact, I am so "in love" with this sampler that I wanted to find a place for her in my family room. Adding a sampler in there is always a challenge since there are already 35 in the room (including Dutch Beauty). Well, I made room although it required rearranging two of my family room sampler walls, and moving one sampler from the family room to upstairs. (My walls are always changing.) Here are the results. Here are some photos of Rachel. 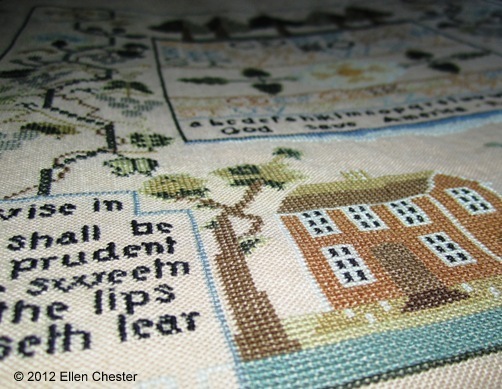 I'm now busily stitching on John Foster (Historic Stitches). My, how I love that sampler too! John was one of my newsletter SALs a few years ago, but I didn't get around to stitching it at the time. 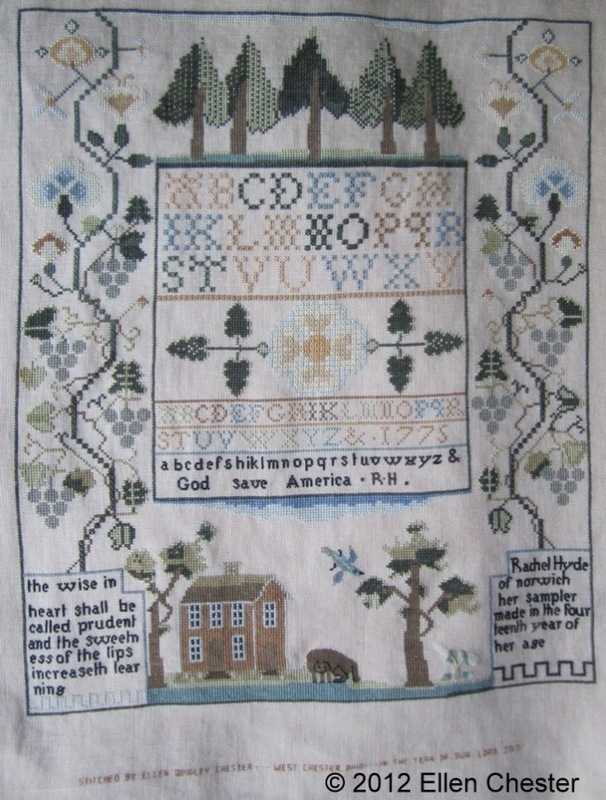 I'm so glad I rediscovered this fun sampler. I had a fun time yesterday at my guild's day-long stitch along. I took a bunch of photos but will save those for another day. I hope that everyone is having a great weekend. Our original Mother's Day plans had to be changed this morning, but I'm looking forward to having a belated celebration in a couple of weeks. Oh my my my! Your sampler walls are just amazing! I'm going to have to look closer once I write this comment. lol! I love how Hannah came out -- beautiful, love that moulding! One of these days I'll get my Hannah -- and Rachel too -- framed. I have this backlog of samplers to be framed. Sigh. I love Rachel and Hannah and they deserve to be framed. Can't wait to see John Foster! Wow, ich bin ja sprachlos. Was für ein toller Sampler und alle anderen. Einfach nur ein Traum. Your samplers and your sampler wall are amazing. Beautiful work! Looking forward to seeing John! I LOVE all of your sampler walls Ellen. What an amazing collection! The frame is perfect for Hannah. 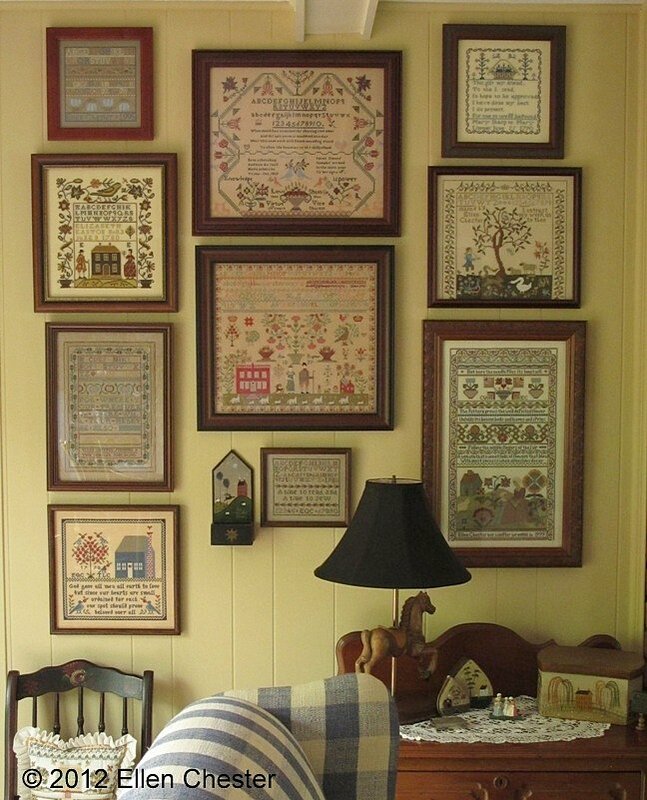 Thank you so much for sharing a photo of your sampler walls... beautiful. I'd love to sit in the room and enjoy looking at all your completed samplers. Ellen I think the wait for Hannah's beautiful frame was worth the wait. Mine is in a similar frame, but it doesn't have the beautiful beading around it. Thank you for showing us your beautiful sampler walls. It is lovely to see them all together. I'm not a very good rotation stitcher either. I am trying to do it at the moment, but find that it becomes quite complicated. 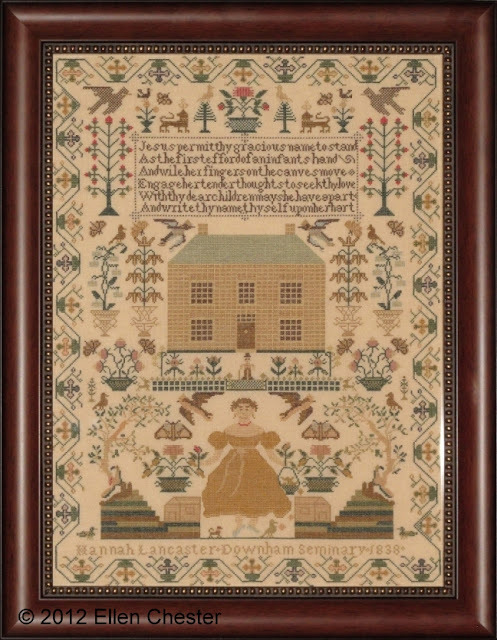 Both the Sampler and the frame are beautiful. I love your sampler walls in your home. Wow! Hannah Lancaster looks so beautiful - and I just love your living room. I had to show those pictures to DH and inform him that one of these days I want all my samplers displayed similarly :) I know you will enjoy her so much. Your framed sampler is beautiful. I am in love with your sampler walls too.... what a great view for your family room! Hannah Lancaster looks so beautiful framed, and I like Rachel too! Ellen your sampler walls are truly amazing! Your new finish is beautiful in fact your walls are truly amazing!!! Those beautiful samplers are well worth the nail holes in the wall!! I'll be getting back to John Foster as soon as I finish the "Penny America." I wanted that one done before Memorial Day. So I interrupted John. I was enjoying it very much! Another beautiful finish. Hannah is awesome. Maybe I need to place her higher on my "to-do" list. Sampler wall is to die for. Thanks for sharing. 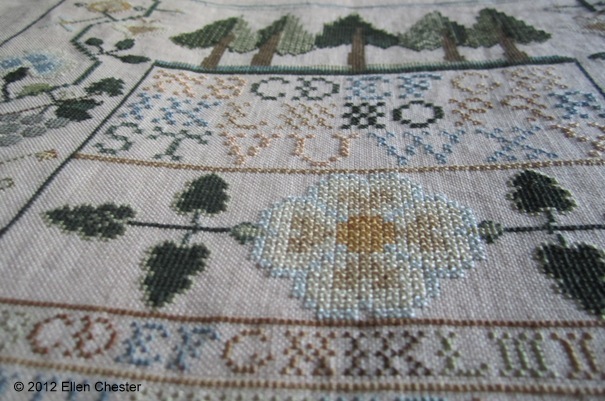 Ellen, your Hannah Lancaster is absolutely beautiful and is a stunning addition to your sampler walls. I don't know why I'm waiting so long to start mine. I can't wait to see your Rachel framed. Both, or rather ALL, your samplers are beautiful. Thank you so much for sharing your display with us!!! Oh goodness, now I love your sampler walls!! Hannah is beautiful. Gorgeous!!!! Love the frame too and what fun to see your sampler walls :-). 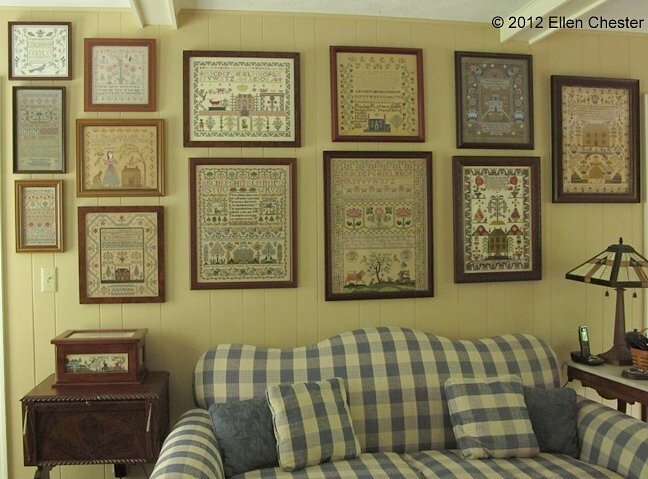 Oh Ellen I do love your sampler wall, must be lovely to sit and stich there! Hannah is wonderful, beautifully framed too, love it! Gosh, so many samplers, but they all look so beautiful. Hannah looks lovely in that frame. Your framer is a talented crafts person. I also want you to know that I too have a blogger here on blogger. I am hoping, in the beginning to blog about my experiences & trials with this Hardanger supper cloth I am finishing for a lady 'up country'. If my placing of the link here irritates or offends, my apologies, and please remove it. She is beautiful, lovely room, you must beam everytime you go there. GASPS!! Your sampler wall!! OH MY!! It's so amazing! Love love love!! Hannah is stunning in that frame and will fit right in with all your 35! samplers!! WOW, I can't believe that sampler wall!! Can you teach me how to stitch faster, please? =) Hannah looks amazing! !